I have vinyl siding that I thought was going to look like new forever. Now it has started to fade and has weather-damaged areas. Must I replace it or can I paint it and save some money? 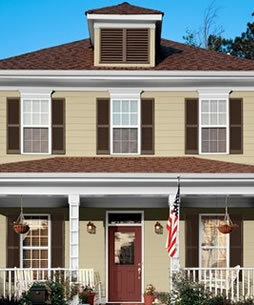 Painting your old vinyl siding makes good sense both economically and aesthetically. Not only can you make it look like new again, you can, if you wish, change the color and give it a whole new look. Note that you can do the same thing with aluminum siding. Surface preparation and the use of a quality paint are the keys to painting both vinyl and aluminum siding. (However, check with the siding manufacturer to make sure that painting does not void the warranty.) But be sure you do not paint it with a color that is darker than the original color. Radiant energy from the sun may warp the vinyl or aluminum in our hot sun. For vinyl, the first step is to remove any chalking and stains as well as any dirt by cleaning with a power washer or by hand scrubbing with warm, soapy water and thoroughly rinsing. one caution: try to remove stubborn stains on vinyl siding with a wire brush, sandpaper or a power sander. These can permanently damage your siding. After the surface is dry, paint using a quality paint. Again, you should not paint with a color darker than the original color of the vinyl siding. Why? Because dark colors can absorb the sun's heat, causing the siding panels to warp. For aluminum siding, any surface oxidation must be completely removed by careful, light rubbing with steel wool. If mildew is present, remove it by scrubbing with a bleach solution (one part bleach to three parts water). Power-wash or hand-scrub with warm, soapy water and rinse. Be sure to remove all chalking, loose paint, dust, dirt, and bleach solution. Spot prime areas where bare aluminum may be exposed. 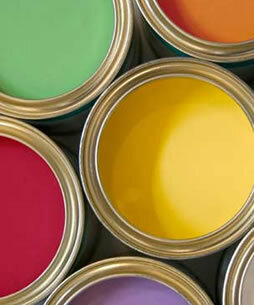 After the surface is dry, paint as you would any siding using a good quality paint. For authoritative advice on repainting your vinyl or aluminum siding along with the proper type and quality paint to do the job, check with us.